This article is the result of years of research, accumulating data, and finally bringing it all together in one place. It has grown beyond the very narrow purposes of identifying certain changes in the Vega made banjo models, especially the Whyte Laydie and Tubaphone, to include when the name stamps changed. I haven't tried to match a date to the serial numbers, but that information -- although at best speculative and approximate -- is available elsewhere, including Mugwumps Online. For the collector/scholar, it is important just to know when changes occured. For the buyer, it is critical to know that an instrument being sold as "all original" probably is. Some of the information here will help. First, it is important to know a few facts. 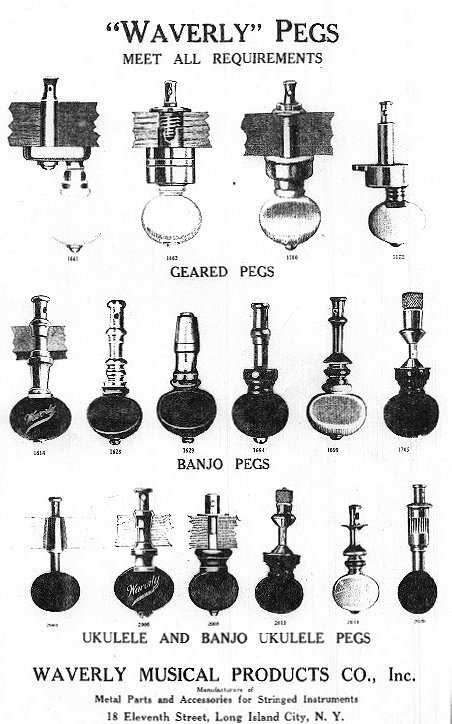 Virtually all the metal parts for nearly all the East coast banjo makers were supplied by one company -- Waverly Music Products of New York, NY, in business from before the turn of the century until the 1970s when they were acquired by Stewart-MacDonald of Athens, OH. I interviewed Waverly's then owner, a Mr. Lomb -- son and grandson of the founders, early in 1970 when he had put the company up for sale. He told me that Waverly, for whom he had worked since his pre-teens, had provided most of the metal parts and accessories to the banjo makers. In his workshop he showed me many patterns, cutters, tools, and dies used in making the nuts for Vega, Gibson, Bacon, Paramount and all the standard nuts we associate with the large makers. 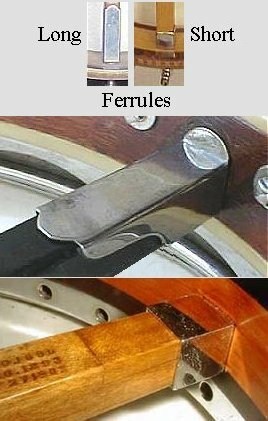 Waverly also made many, varied, stretcher bands, the simple brass hoops used for tone rings on the less expensive instruments, and some of the components that went into the more sophisticated tone rings. 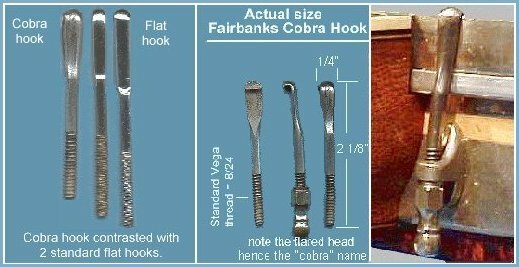 They also made the various shoes and hooks, from the Cobra hooks used on early Fairbanks to the modern flat and round hooks. Most of the tailpieces and many of the tuners also came from Waverly. That there were others making some hardware is indisputed, but Waverly made most of it. I don't know if they made the Whyte Laydie and Tubaphone assemblies or if some of the parts were made locally and then assembled at Vega -- the most likely scenario. It is likely that Vega did not stamp the serial number on a rim until final assembly, just before it was ready to be shipped. Since the rims were assembled separately from the necks, and since Vega made & sold a variety of styles (5 string, tenor, guitar, mandolin, plectrum, etc.) it stands to reason that the serial number wasn't afixed until the neck and rim were mated. This would explain why some rims have hardware and specifications after the time when some parts were disountinued. It seems especially true for the earlier Vega #7's and #9's which clearly sold in smaller quantities, and the assembled rims might sit around for a while. It does not explain the apparent anomolies of name stamps appearing with serial numbers earlier than expected. Two possible explanations occur to me -- there may be others. First is simply a reporting error, but I have seen some personally, and been sent photos of others. The other possible explanation might be that the banjo was returned to the factory, given a new neck with new logo stamp, but numbered with the old serial number. Your thoughts on this and any other factor relevant to this study are welcomed. Be sure to visit the article Fairbanks & Vega Dating for more information about this project and a summary of my conclusions based on the instruments listed below. Instruments with serial #s between 26019 and 26023, when the switch from Fairbanks plate to F-V stamp seems to have occurred. Serial #s for WL or Regent models with left (reversed) facing Gryphons all seem to be in the 24000 serial numbers. Any model F-V or Vega banjo with serial #s between 52669 and 52684 (a 15 number range), when the switch from "Fairbanks Banjo, Made by Vega" stamp to the "Made by Vega" stamp seems to have occurred. Vega serial #s between 99369 and 99686, when the switch from the Vega stamp to printed yellow labels seems to have occured. Serial numbers from the "Made by Martin" era. Please send any information directly to me. Mike Holmes. Thanks. F&C - 1000 Earliest reported Cobra hooks. F -- c15000 Introduction of A.C. Fairbanks metal plate. F SE5 17607 Earliest reported Special Electric #5. F WL2 20343 Earliest reported Whyte Laydie. F-V TU3 25269 Unexplained anomoly, confirmed, perhaps returned to factory? F R 25980 From this point, the WL &TU specifications remain unchanged. F TU3 26019 Latest reported Fairbanks plate. F-V Elec 26023 Earliest reported F-V stamp except anomolous #25269. F-V WL2 26484 Orig 5 string w/A.C.F. plate & stamp. F-V TU9 30441 Latest reported style 3. Flowerpot peghead inlay. F-V TU9 52669 Latest reported F-V stamp. V Senator 52684 Earliest reported Vega stamp. V WL2 91892 Earliest bracket band drilled with bolts through rim. V Vox1 99369 Highest Vega name stamp, pre-yellow labels. V Vox4 A99610 Coordinator rods, lowest yellow label, wood strut, A = adjustable truss rod. V PS A99686 Yellow label, coordinator rods. V WL A99815 Yellow label, wood strut. Rim Full Spun, Thin=3/8", Thick=7/16"-1/2"
Acknowledgements: Thanks to all who took the time to write to me, but especially to Hank Schwartz and Jim Bollman. Attention Webmasters: You are welcome to link to this page from your website, crediting the source, but you may not copy it or any part of it, and post it at your site. Thank you for your cooperation.